Once again, I interrupt the regular Longbox Junk flow by bringing you fine folks of Comic Book Realm another single issue review from my collection of a comic that's a little older, maybe a bit more valuable than the Longbox Junk I normally talk about, and that I don't have a full run of. It's already been published elsewhere, but like I always tell my kids. . .If you haven't seen it, it's new to you, right? So let's do this! 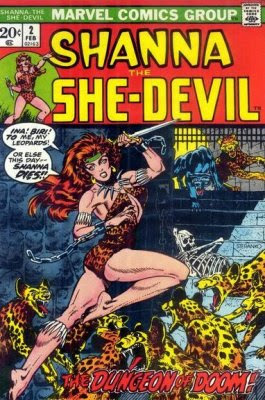 The second issue of Marvel's short-lived Shanna The She-Devil series (Just 5 issues from 1972 - 1973), which was part of a Marvel initiative for female writers and comics aimed at a female audience. Unfortunately, the initiative seems to have been a bit half-hearted. . .there were only 3 titles (Shanna, Night Nurse, and The Cat), and of the 3, only Shanna lasted 5 issues (the others only went for 4). Shanna is enlisted by S.H.I.E.L.D. to stop a criminal named El Montano from hijacking a French rocket. She travels to his hidden fortress on the edge of the Sahara Desert, but is captured and must fight her way to freedom in order to accomplish her mission. I actually knew nothing about Shanna The She Devil before reading this comic, but learned everything I needed to know about her through exposition as I read. You have to hand it to the writers of the Bronze Age, they were blunt, but subtle at the same time. . .at least in this case. The story was well written and moved along quickly. Unfortunately, the plot itself was pretty ridiculous. . .a French moon rocket loaded with heroin being hijacked by a desert slaver? But that said, I still found the writing to be brisk and pretty good. The line art and inking were very well done. . .giving Shanna the same almond eyes and lithe form that Ross Andru brought to the Diana Prince de-powered version of Wonder Woman. Unfortunately, the coloring is a bit slapdash. It gets worse toward the end of the book, starting to get particularly sloppy starting with page 26. There's no color "credit" for this issue, and I can hardly blame them for not wanting one. To tell the truth, this would have been a VERY nice black and white comic. The cover by Steranko was good, but not great. Definitely not his best work, but still an eye-catcher. At the end of it all, coming into this issue with no knowledge of the character, an overall weak plot, and some sloppy coloring, I still found myself wanting to read more about her at the end of it. It's not the greatest comic I've ever read, but it had some brisk writing and great art. Back to Longbox Junk Business as usual with more Topps X-Files.